With comsats (communication satellites) and weather satellites in geosynchronous orbits 23,000 miles above the Earth, and photo recon satellites ranging in altitude from hundreds to thousands of miles (depending upon the resolution required for viewing the target area), the purposes of the various military satellites operated by various countries are as varied as they are secret. Additionally, the latest flock of military satellites also carry civil bandwidths for government, non-military use  multi-tasking of the MILSATCOM kind. After going through a year of vast changes in program orientation, budgetary allocation and delays or outright cancellation of satellites, the Government and Military Satellite Communications (GMSC) market still faces one stable trend: bandwidth demand. 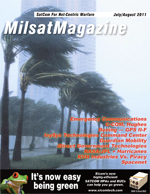 For this ISR issue we spoke with Lloyd Palum, who is the Senior Principal Engineer for Harris RF Communications. Mr. Palum is currently responsible for the strategy, development, and general management of tactical communications products in ISR for the Company. Previously, Mr. Palum oversaw wireless networking product strategy, including marketing analysis and a phased set of software releases that cover IP networking, security, and wireless protocols. He has also served as a systems engineer responsible for definition of design and architecture on the Falcon III JTRS SCA compliant family of radios and supervised a staff of 12 in the development and delivery of key SCA radio software components for the JTRS-Approved Falcon III AN/PRC 152(C) handheld radio. Mr. Palum has authored numerous technical conference publications and customer presentations and publications. Mr. Matheson is responsible for TerreStars corporate planning and drives the technical direction and delivery for development of the satellite and network systems and handset technologies for TerreStar Networks. Prior to joining TerreStar, Mr. Matheson was the Senior Vice President and Chief Technical Officer for Motient, providing the technical direction for all services, responsible for the ground station development and satellite operations for the L-band spectrum. He previously was the Senior Manager of Systems Architecture for Bell Northern Research, a provider of telecommunications equipment for wireless and wireline applications. He has also held engineering positions with Texas Instruments. Mr. Matheson holds a B.S. in electrical engineering from Clemson University and an M.S. in electrical engineering from the University of Tennessee. In a recent report, Northern Sky Research stated that satellite operators had increased their revenues in 2008 and forecast steady growth in 2009 with their revenues rising by an impressive 50 percent to 2018. This is good news indeed, with obvious demand fueling growth even in very difficult economic conditions.